[00:28:42] <cradek> jepler: I want to try max/5i25 on uspace. should I be building jepler/rtos-uspace-aps? [02:52:08] <cradek> skunkworks: I was running uspace/5i25 on the -rt kernel. [03:27:10] <cradek> yep, it's really a great thing. [03:47:36] <skunkworks> although it does give the unexpected realtime delay on task 0 twice in the terminal..
[13:48:38] <jepler> skunkworks: printing twice is slightly interesting. I assume that's a base-thread-only setup. [15:42:06] <seb_kuzminsky> jepler: did you get my code-review comments? [15:48:24] <jepler> seb_kuzminsky: "normal" build sys was the kernel 2.4 pre-"kbuild" module build system. [16:09:34] <seb_kuzminsky> i've made a note to remove it. at some point. 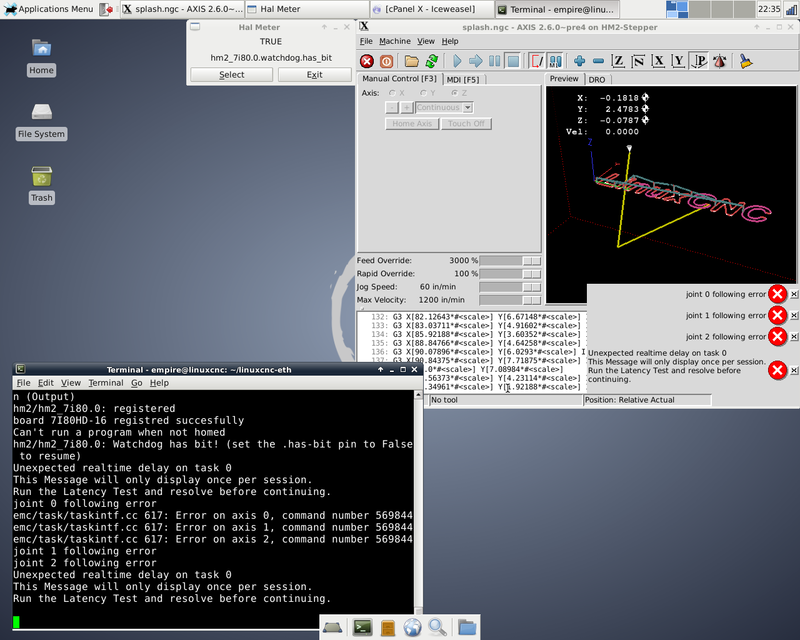 [16:50:11] <jepler> Instead of working on seb's review items, I worked on userspace parallel port stuff this morning. [17:32:28] <jepler> darn, 7i43 doesn't work on the first time, and now it's time to leave..
[19:40:31] <cradek> where does one find live bluegrass? [20:38:46] <jepler> cradek: out at one of the local wineries. they're done now, unfortunately. [20:53:48] <jepler> cradek: I just "dd" the hybrid.iso to /dev/sdX and boot? [21:28:20] <cradek> someone actually did it? I thought that was just a fever dream of yours. [21:30:26] <cradek> on a fast or slow machine? [21:31:32] <jepler> that means "geez, you shouldn't even put this in /etc/rc.d"
[21:37:30] <jepler> pcw_home: not linuxcnc? [22:07:30] <pcw_home> still --addr for epp address? [22:35:44] <jepler> seb_kuzminsky: that'd be great. can it be its own topic, after merging uspace? [22:40:07] <seb_kuzminsky> i should be testing jepler/rtos-uspace-apis for hm2-pci, right?